In his eulogy to Shakespeare published in the 1623 First Folio, fellow playwright Ben Jonson praises Shakespeare’s literary accomplishments despite his having “small Latine, and lesse Greeke.” While Shakespeare put to use what he did know of Latin and Greek in many of his plays and sonnets, he is better known today for his innovative use of the English language. 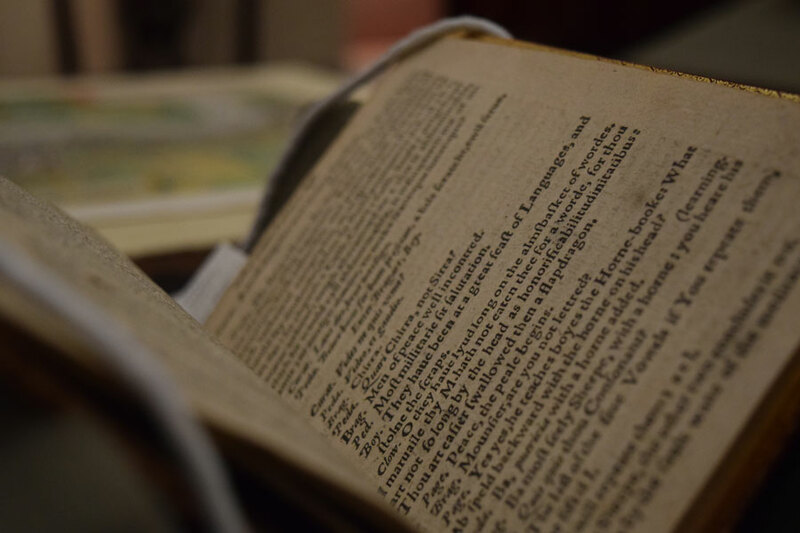 Shakespeare turned nouns into verbs (grace, season), created compounds (faire-play, pell-mell), and added prefixes and suffixes (courtship, dauntless, disgraceful). His works were the first to record such words as ‘laughable,’ ‘eventful,’ ‘accommodation’ and ‘lack-lustre’. But Shakespeare was far from alone in this lexical creativity. In fact, he was part of an early modern trend that saw between 10,000 and 25,000 new words enter the English language in the fifteenth and sixteenth centuries. Within the Inkhorn Controversy there were those who supported borrowings and coinages. These Neologizers believed such practices would enrich the English language, which during the Tudor period was considered ‘rude’ and ‘barbarous,’ lacking the appropriate words to express learned ideas. Sir Thomas Elyot was an early Neologizer who, aware of the confusion a new word might cause, would pair it with a more familiar synonym or an explanation to aid readers’ understanding. Thomas Elyot. The boke named the Gouernour. 1531. STC 7635. Some Purists even went so far as to outright condemn foreign borrowings, such as Sir John Cheke, who in a 1557 letter to Thomas Hobby wrote: “I am of the opinion that our tung should be written cleane and pure, vnmixt and vnmangled with borowing of other tunges.” In order to avoid using borrowed terms, Purists of this strain invented their own compounds from Saxon words. In the 1590s and early 1600s, debate over the Inkhorn Controversy intensified, and focused on particular practices, such as the affected use of elevated language. Shakespeare, in his play Love’s Labor’s Lost, mocked this affectation through the characters Holofernes (the pedant) and Nathaniel (the curate), who speak in a mix of not-always-correct Latin, English, and French. The play itself is filled with wordplay in the form of puns, metaphors, malapropisms, and corrupt and nonsensical Latin. It also contains the longest word in all of Shakespeare’s works: honorificabilitudinitatibus, which is spoken by the clown, Costard, (5.1.143). 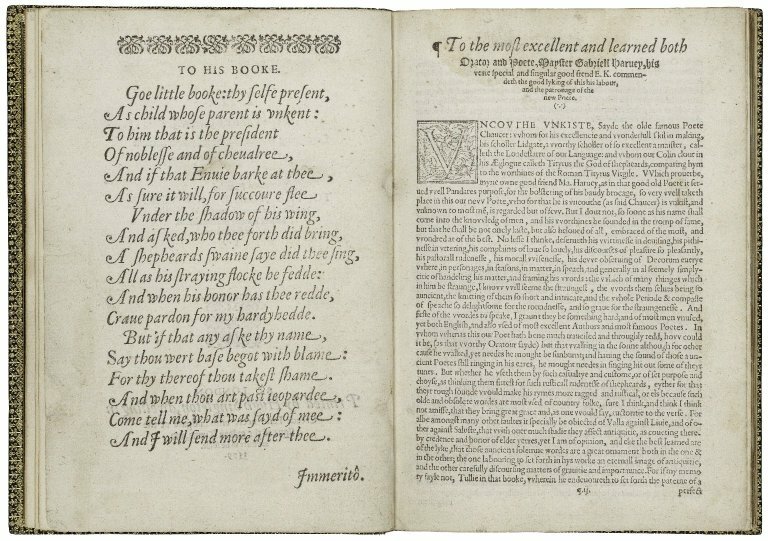 1598 quarto of Love’s Labor’s Lost by William Shakespeare. STC 2224 copy 1. These opinions manifest on stage in several of Jonson’s works. Cynthia’s Revels (1600), includes an attack on “your ignorant poetasters of the time, who, when they have got acquainted with a strange word, never rest till they have wrung it in, though it loosen the whole fabric of the sense” (2.4.15-18). And in his 1601 Poetaster, Jonson attacks fellow dramatist John Marston, who was known for his elaborate neologizing, by portraying him as Crispinus, who vomits up bombastic and ridiculous words. By the mid-sixteenth century, the Inkhorn Controversy had been taken up by lexicographers who were compiling the first monolingual English dictionaries. The first few English dictionaries covered “hard words” (i.e., inkhornisms) that had newly entered the language and were difficult to understand. In 1656, Thomas Blount published his Glossographia or A dictionary, interpreting all such hard vvords, whether Hebrew, Greek, Latin, Italian, Spanish, French, Teutonick, Belgick, British or Saxon; as are now used in our refined English tongue. Designed to help readers’ “understand what they read,” Blount’s dictionary was the first to give both sources and etymologies for the words he included. Two years later, Edward Phillips published The new world of English words: or, a general dictionary: containing the interpretations of such hard words as are derived from other languages; whether Hebrew, Arabick, Syriack, Greek, Latin, Italian, French, Spanish, British, Dutch, Saxon, &c. their etymologies and perfect definitions: together with all those terms that relate to the arts and sciences. Phillips plagiarized nearly half the definitions and the title for his work from Blount’s Glossographia. From the fourth edition of New World of Words, published by Edward Phillips. This list of inkhorn terms, purposefully offset from the main body of the dictionary, was almost entirely made up of words from Blount’s Glossographia. Among the inkhornisms Phillips cautions against using are flexiloquent (speaking so as to bend or incline the minds of others), honorificabilitudinitatibus (honourableness), libanomancy (divination by frankincense), opisthographical (having something written on the back), quinquipunctual (having five points), and vulpinarity (a fox-like subtlety). Paula Blank. Broken English: Dialects and the Politics of Language in Renaissance Writings (New York: Routledge, 1996), 18. “Ink-horn term” is first attested in 1543 (“ˈink-horn, n.”. OED Online. March 2019. Oxford University Press. http://www.oed.com/view/Entry/96130?redirectedFrom=ink-horn+term) and “Inkhornism” first appears in 1597 (“ˈinkhornism, n.”. OED Online. March 2019. Oxford University Press. http://www.oed.com/view/Entry/96131). Charles Barber, Early Modern English (London: W&J Mackay Limited, Chatham, 1976), 72. David Crystal, The Stories of English (London: Penguin Books Ltd, 2004), 293. Sara Schliep is the third Nadia Sophie Seiler Rare Materials Resident at the Folger. 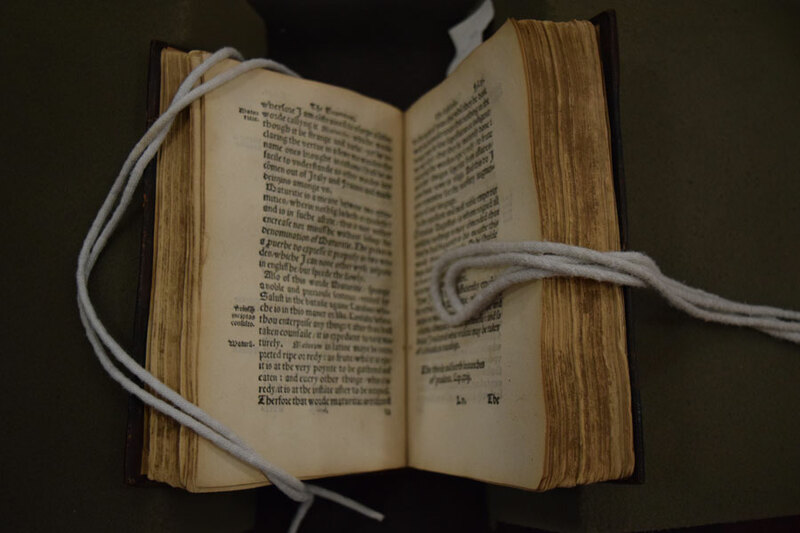 As part of the Cataloging Description and Imaging Team, her residency focuses on cataloging early modern manuscript material and has also included project work in Acquisitions, Conservation, and with the Folger’s institutional archives.